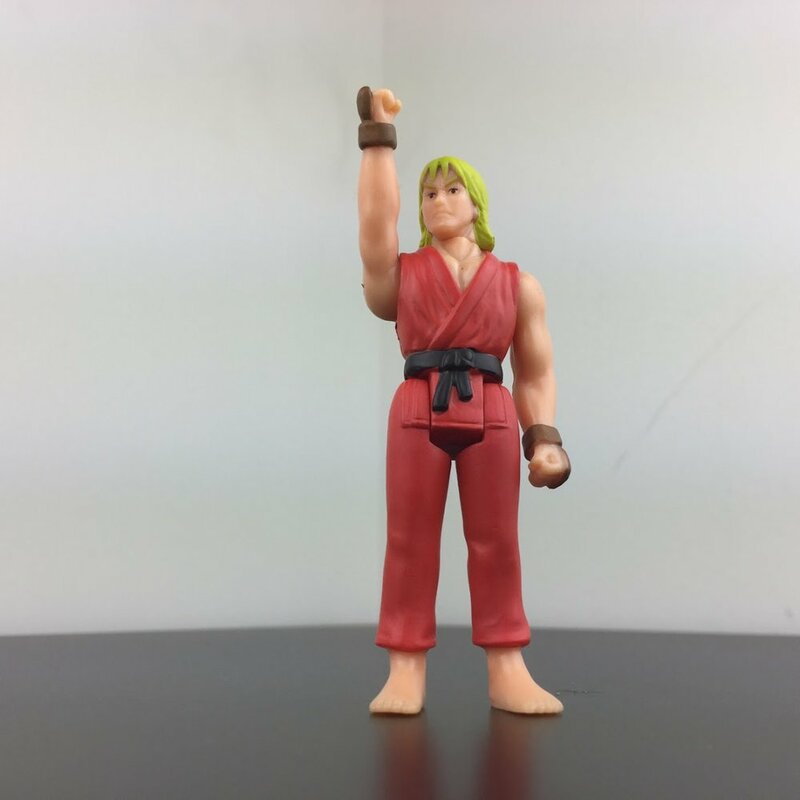 Street Fighter II ReAction Figures Are The Figures The Series Deserves — GamingWithSwag.com - Dads By Day, Gamers By Night. As I mentioned last week, this year game fans are celebrating the 30th anniversary of Street Fighter, the beloved property that made “Hadoken” a household word. 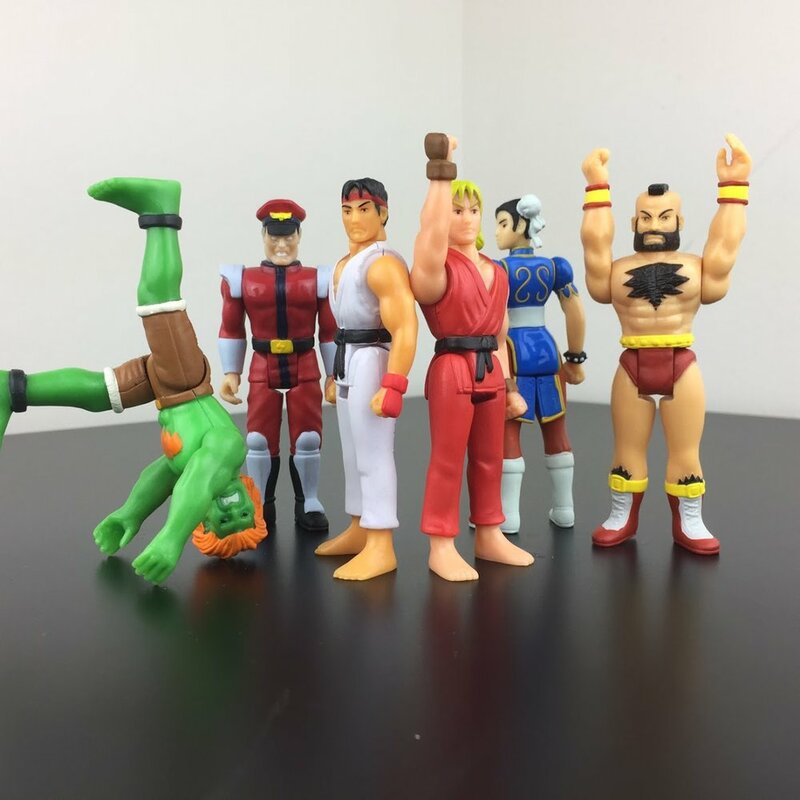 In conjunction with this milestone, new Street Fighter swag is hitting the market, including new 3.75” figures from Super7 as part of their ever-growing ReAction Toy Line. To provide some context, ReAction figures are designed to capture the aesthetic of figures from the late 70’s that launched the boom of the 3.75” (or 1/18) scale collecting hobby. Kenner’s seminal Star Wars line is the most well-known toy of this size and style, and with retro being as popular as it is, ReAction has sought to rekindle love for the simpler sculpts and gentler fun of yesteryear, with some real successes . ReAction began as the imprint under which previously unproduced molds from the 1977 film Alien were finally put into production 30 years after the film’s release,and the line tends to include imaginings of how figures from some well-known 80’s properties might have appeared in this scale, such as Escape from New York or Predator, were they made at the time of the film’s release. While these properties had collectibles in the extreme era of the 1990’s, they had no real toy product to accompany them during their respective theatrical runs. ReAction offers what may have been, and it’s a great concept for a toy line, though not without its own inherent limitations. Take that into account as you read further. Packaging: These figures are fantastic collectibles on card; in fact, part of the cost is the card design. Super7 went all out with new artistic renderings of the characters they have made available, with fantastic design on the front of the blister card. And the cardback is almost better. It boasts a character-select screen straight from the game that highlights the figure in question. So, you not only get a unique toy version of the character but a sweet printed screenshot on a sturdy blister card, as well as a new piece of SF artwork. All big wins for the on-card collector. The card art is amazing, some of the best we have seen. Craftsmanship: Considering the goal of the line, the figures are well-designed, and they are made of a good quality plastic. The produced figures have a few seams that have minor slits, but I may have only noticed them because, well, figure reviewers notice that kind of thing. Regardless, the figures feel sturdy and fit the ReAction aesthetic nicely. 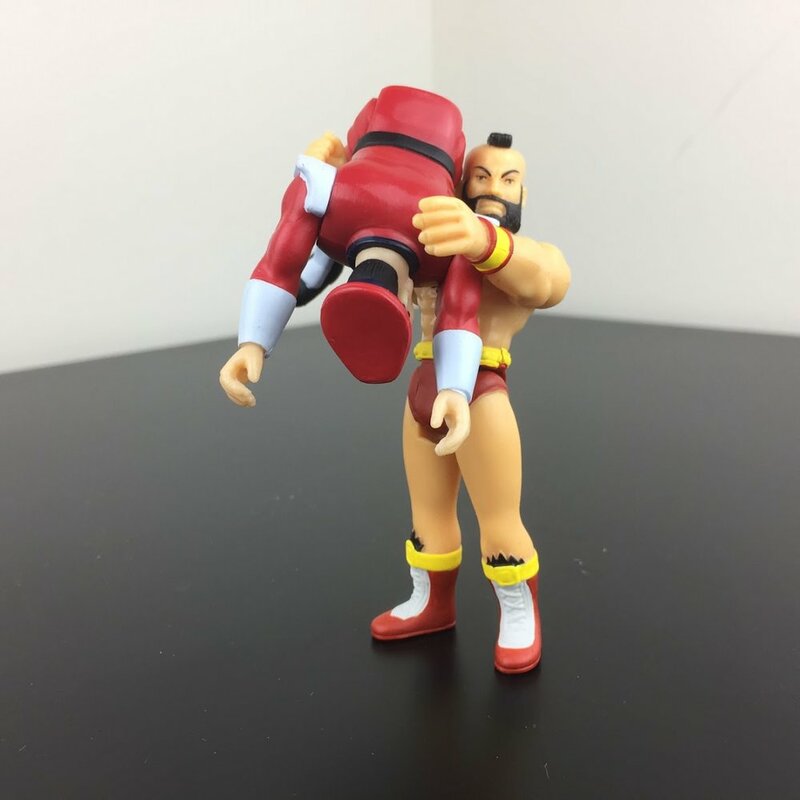 They have limited articulation that is part of their retro factor, offering buyers 5 swivel joints: one at each hip (2), one at each shoulder (2), and one at the neck. Collectibility: This is yet to be determined, but I think that folks whose favorite character is in this initial wave will be pleased with this latest version. Value: $15 puts these at a higher price point than the other ReAction figures but that’s not bad for the on-card collector to have this total package of pop-culture art. For those who open their figures and aren’t as impressed with packaging, the deal becomes a bit less enticing. VERDICT: PLAY BUT PRESS PAUSE. 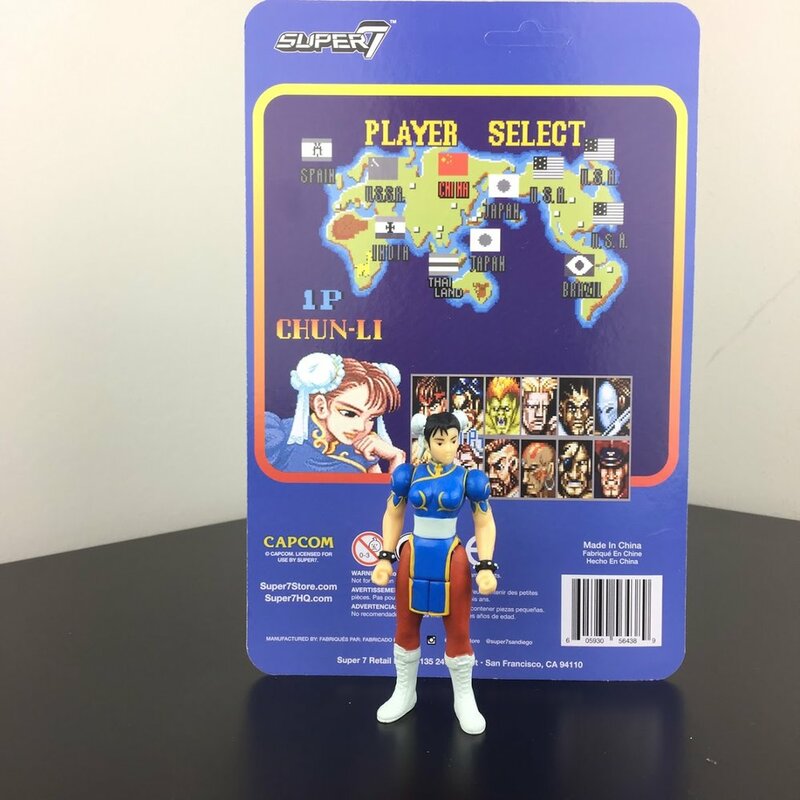 Of all the ReAction figures, the Street Fighter II releases are something of a unique subset, because 3.75” scale figures of these character WERE available in the game’s heyday. Unlike Alien, Big Trouble in Little China, or Predator, this ReAction property cannot offer fans something they were denied previously. What’s more, the original releases were more articulated; they were re-tooled G.I. Joe molds from Hasbro, with newly sculpted heads for the SF characters. So, the question becomes, how do these 3.75” offerings compare against the original ones released over 20 years ago? Is it worth it to buy these or hunt the originals on the secondary market? There are multiple fair answers to that question. 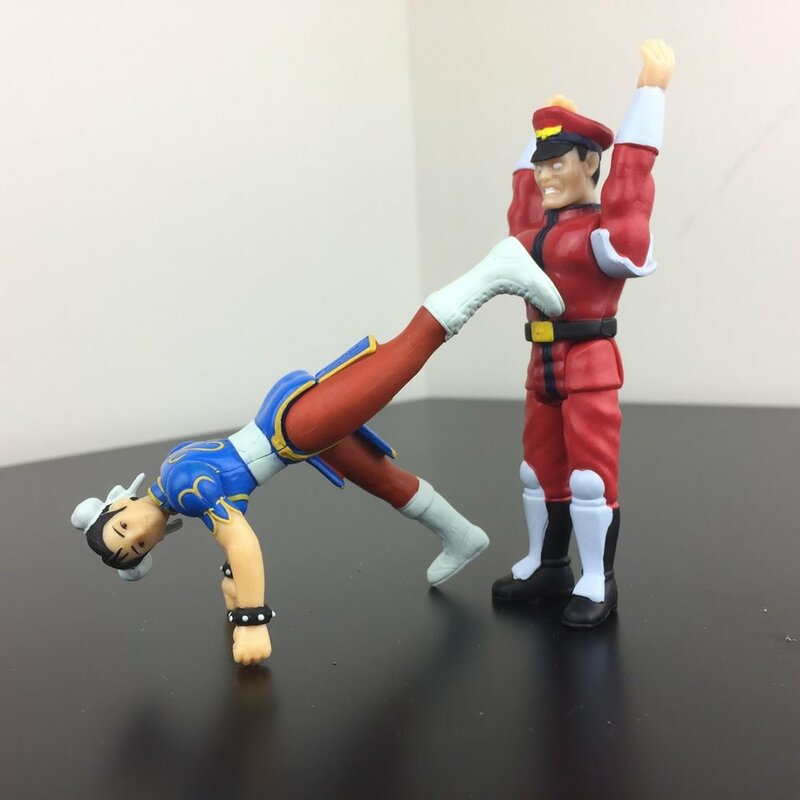 One could go new and go big and collect all the ReAction figures, BUT they will have to settle for half the SF roster—and as I said in my other recent product review, Street Fighter Fans have had plenty of lines with incomplete rosters. A bit of a gamble. One could pick and choose, as the lines blend together okay. This is my chosen method, and I’ll explain why. 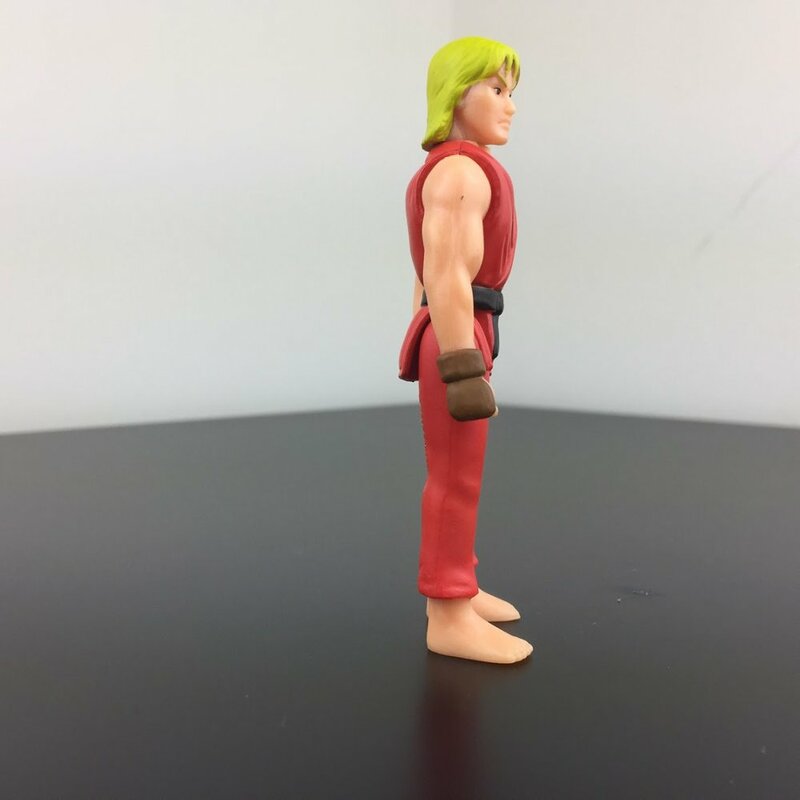 Because the original Street Fighter figures were, for the most post, repainted and retooled molds, they were glorified kit bashes—really great and innovative for their time, but to some degree, inadequate. Super7’s sculpts are original and accurate to the game, even if the detail is somewhat downplayed for kitsch factor. Hasbro’s original Ryu figure was adequate (and the movie version was just strange), but Super7’s is fantastic. 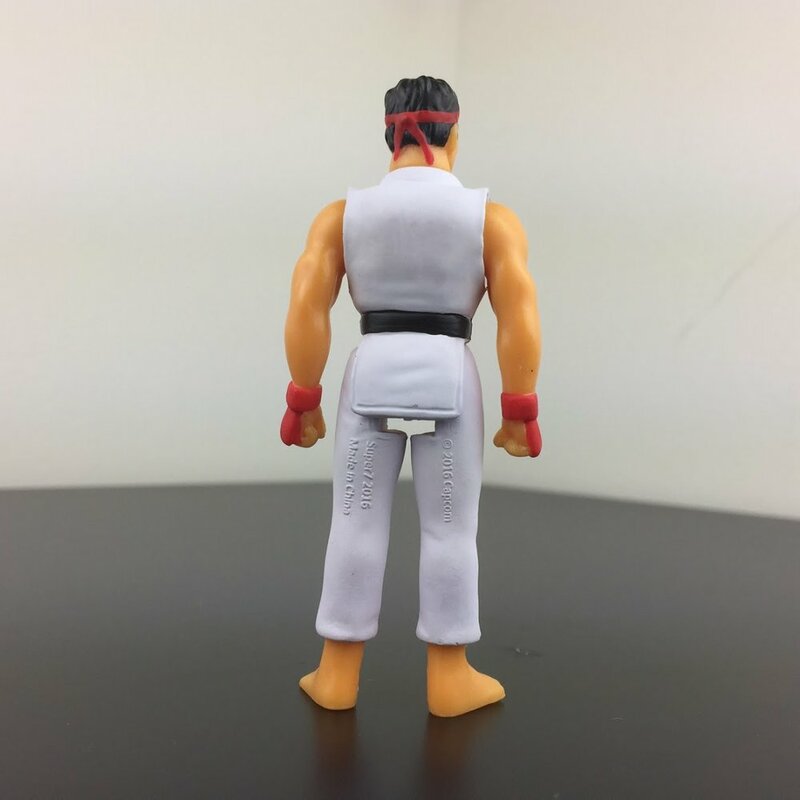 If I want a 3.75” Ryu, this one’s my jaun; no questions. The same argument could be made for any of the characters given one’s personal preferences. 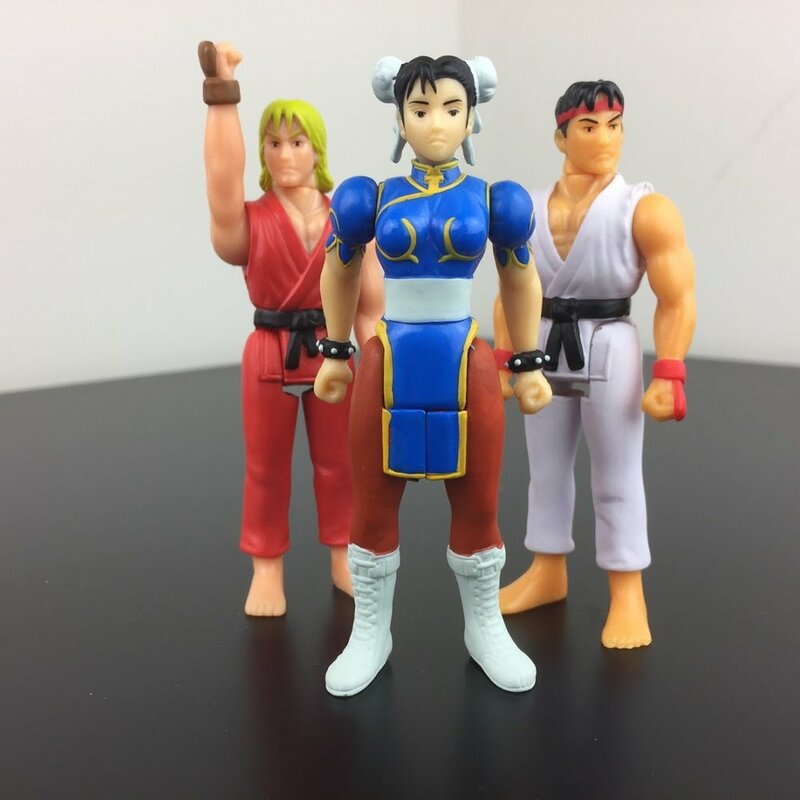 For example, the original Chun-li was always pretty good, especially consider the limited female figures available at the time, but this new one knocks it out of the park completely. So, if you want to pick and choose to upgrade a current 3.75” collection, these will do the trick, even if the back half of the character line-up never reaches production (which would be a real shame). In fact, one could get this whole line and collect or keep the GI Joe versions of the other 6 characters and have a really nice 12-figure set. I know I am hung on the collecting issue, so let me dial it back a bit. For all intents and purposes: these are good figures, and the Street Fighter fan will likely find them to be neat additions to their collection. Taken in the current landscape as far as Street Fighter product is concerned, these offer bang for the buck, giving buyers some great artwork and some fun factor to boot (you can see it from the review photos), ut even on its own merits, the line feels incomplete. Which brings me to my last real point: in a perfect world, all 12 original SF2 characters would have been released as ReAction figures simultaneously, and fans would have been able to drop the $180 or so and get the full-line-up, done deal. I would have likely given it a resounding GAME ON verdict. In the current figure landscape, where fortune changes hands like cookies and a line’s demise can come at any moment, it’s hard to bank on this line completely in its current form. Fo now, I think you have to be a little choosy, especially at the price point. Of course, the great dilemma in doing so is that IF the other 6 original character ARE released after this first wave has fully ended production, it’s going to be tough to get the full set, so you may want to gamble now and get them while you can—at least your favorite character. On card, it’s a really great offering. Loose, still fun, if you dig the mindset behind it. PS - I know I did this last week when discussing the M.U.S.C.L.E figures, but I really hope that Super7 is able to offer these molds in Player 2 colors—even as comic-con exclusive box-set for $200, the 2nd player characters would be really cool to have available and would, again, up the value factor of the whole line. All 12 characters, each available in 2 versions, now that is something worth celebrating. Chris, Dean, and NextGen Dave unbox and review the first wave of the new Street Fighter II Action figures by Super7. Licensed by Capcom. 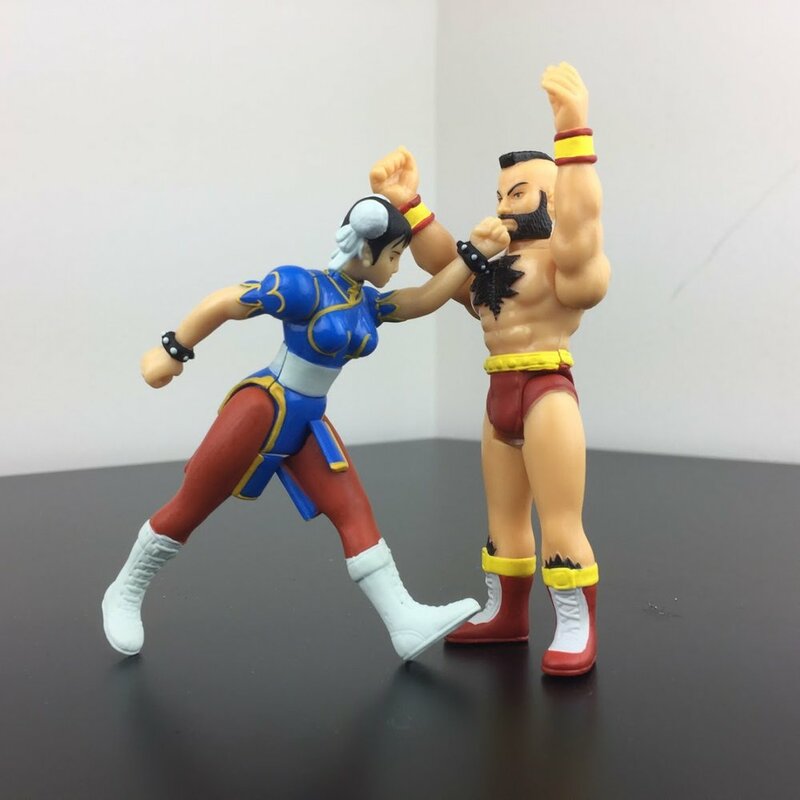 Get your Street Fighter II Action figures here: http://bit.ly/2l8fTD2 Click to Subscribe ► http://bit.ly/subscribeswag Let me hear your thoughts on what you think of this review video.